Sometimes everything’s just meant to be. This is one of those times. It’s a random get-together; my Twitter friend Nanny Pat from Bosinver Farm Cottages has suggested we meet with her family and friends to explore a special beach that her son loves. Sounds good to me! The sun is struggling through the clouds as we all descend from Mawnan towards the glittering shore. We are nine adults, six children, one dog, some huge buckets and a promisingly enormous picnic bag that Nanny Pat has packed for us. We waste no time and strike out across the slippery rocks. 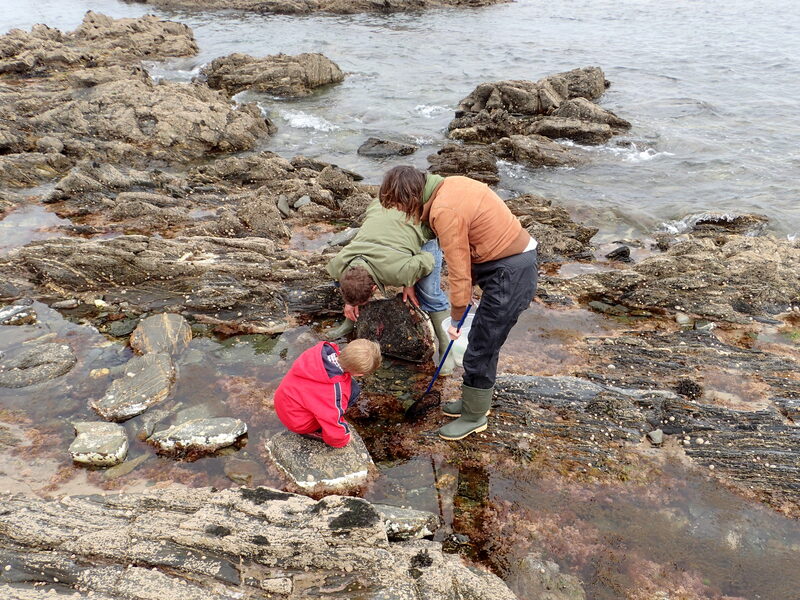 These are serious rock poolers. I am, as other half puts it, “among my people”. We set to and the finds flood in. 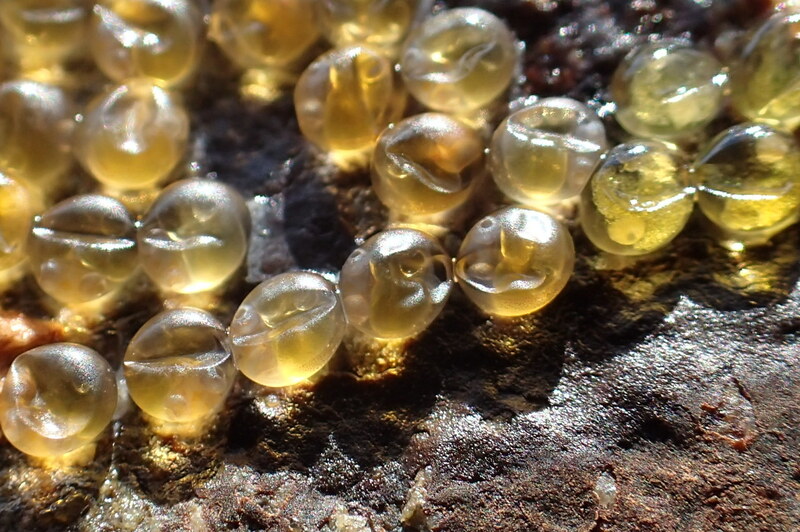 There are fish eggs everywhere, some are just starting to develop like these clingfish eggs. 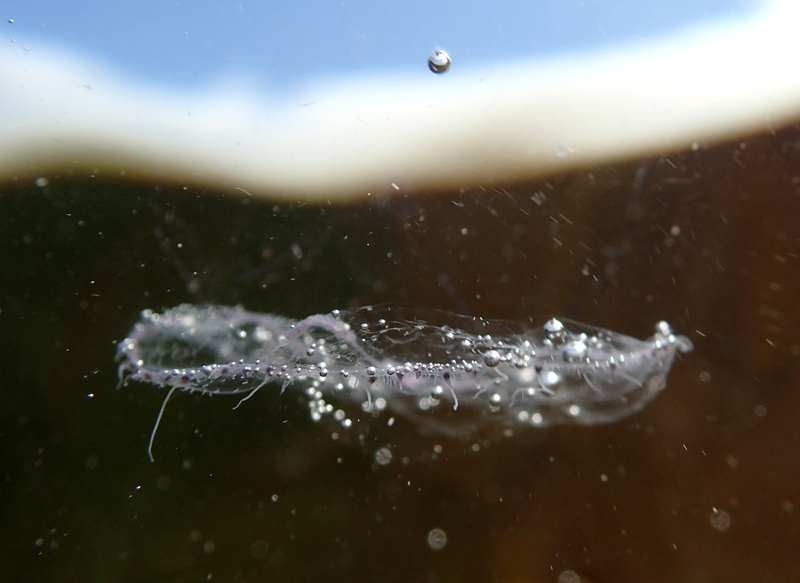 Others are nearly ready to swim away, eyes jammed against their transparent egg cases, tails squished around them. Best of all, I’m baffled by some of the creatures we find. 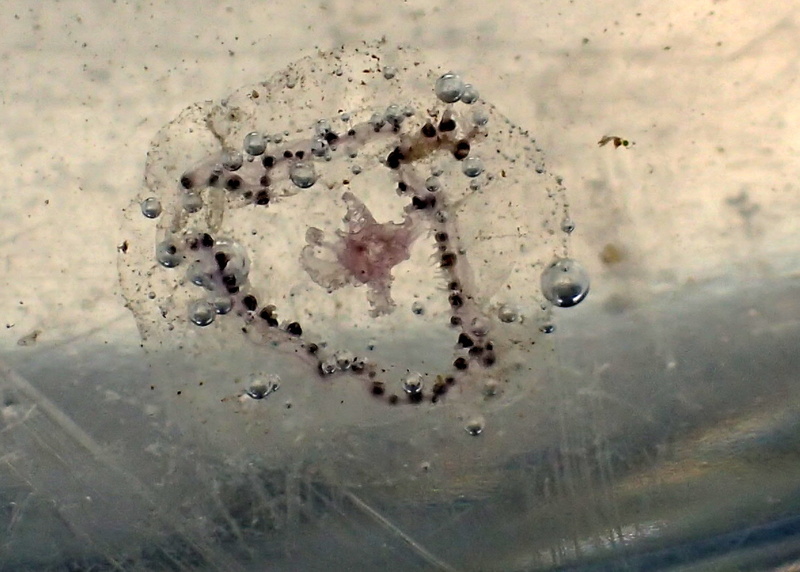 First there’s a transparent disk of jelly a centimetre across. I scoop it up in a tub and peer at it until I go cross-eyed. It shows no sign of life, but I’m sure it is an animal. All around its rim are mauve dots and a thin purple cross hangs across its centre. I rule out all the UK jellyfish and it’s the wrong shape for a sea gooseberry. 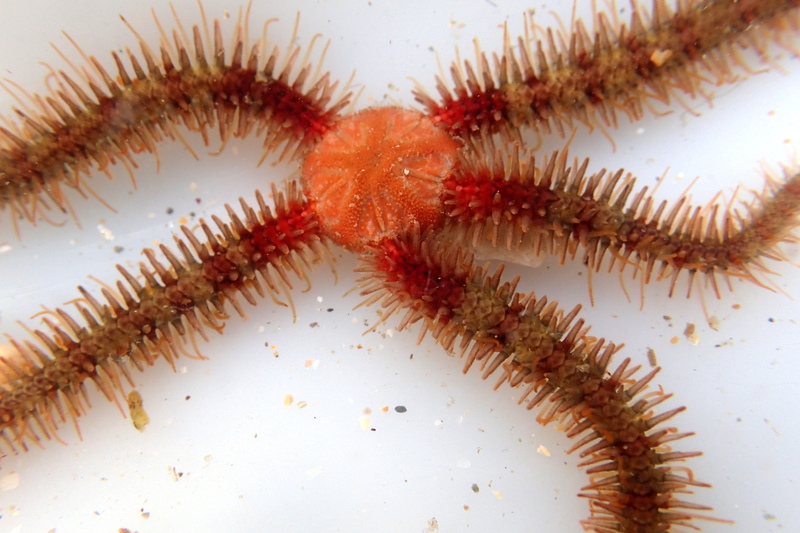 When I take a photo of it in the water, my camera shows some short tentacles, invisible to the naked eye. Having since consulted the experts, it looks to be the medusa (jelly) stage in the lifecycle of some sort of hydroid or sea fir. 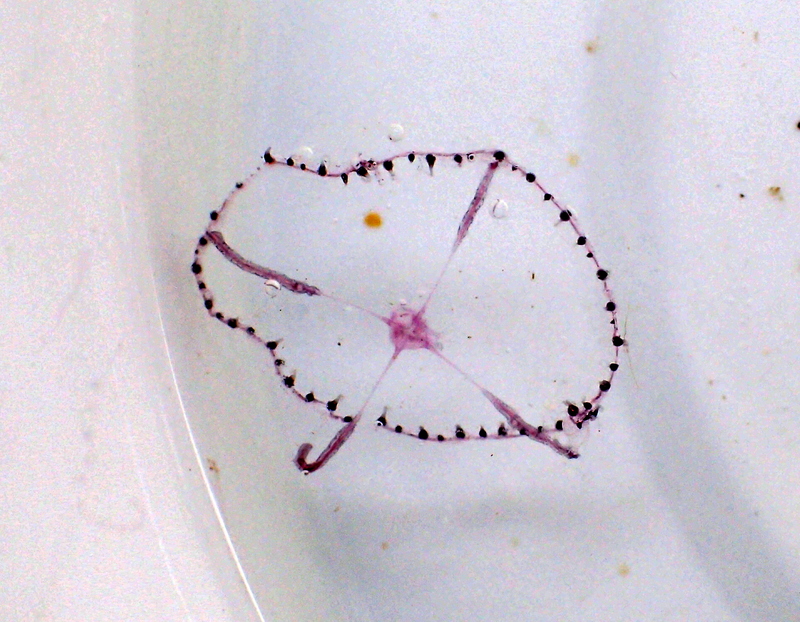 Swimming free – the side view with tentacles showing. I’m distracted from my observations by some excited shouts and squeals. “Quick, we’ve found a shark!” one of the adults calls. 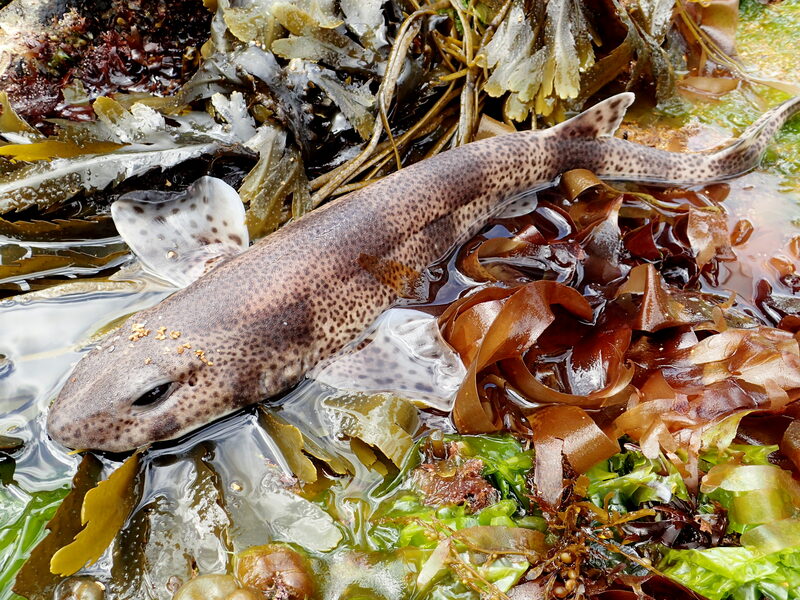 The children are gathering around the edge of a pool and there in some shallow seaweed, a dogfish (small spotted catshark – scyliorhinus canicula) lies stranded. The animal is calm despite being out of the water and surrounded by eager kids. We take a minute to take photos. Some of the children tentatively touch its sandpaper-rough skin and Cornish Rock Pools junior sluices it with water in an effort to keep it happy. The dads rush in for the privilege of relocating our shark to a deeper pool, where it lurks as we carry on our rockpooling. 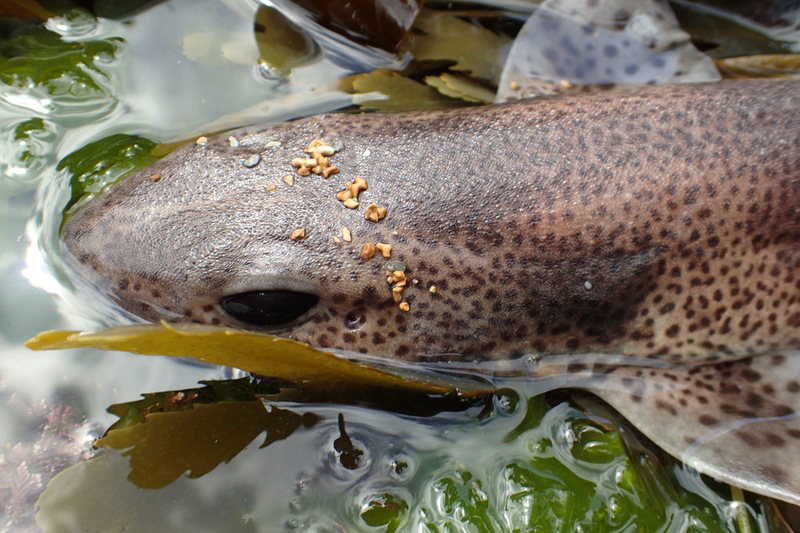 The ‘rehomed’ catshark waiting for the tide to come in. It’s so well camouflaged it’s tricky to spot among the seaweed. One of the finds, a little fish catches my eye. 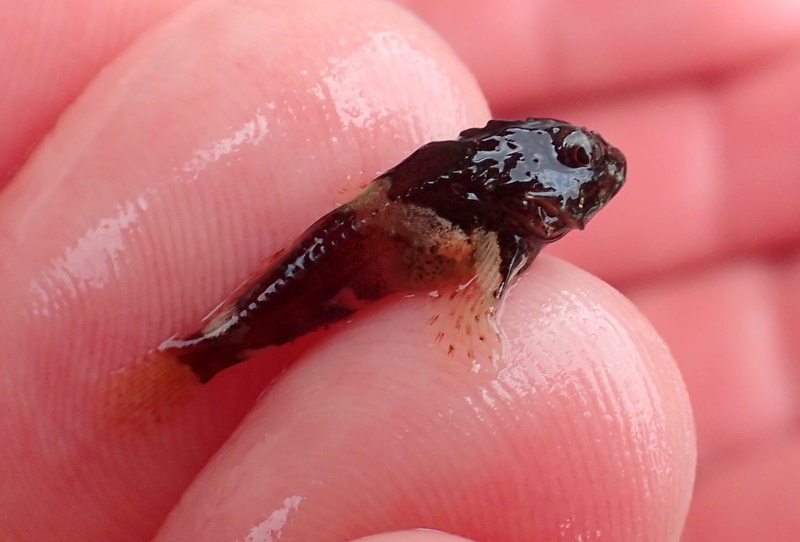 When I first see its red body and dark head, I think it could be a black-faced blenny. The shape doesn’t seem right though. After much staring, I conclude it’s probably a scorpion fish. In my photos the spines on its face can be seen more clearly, confirming that it’s the smallest specimen of this species I’ve ever seen. 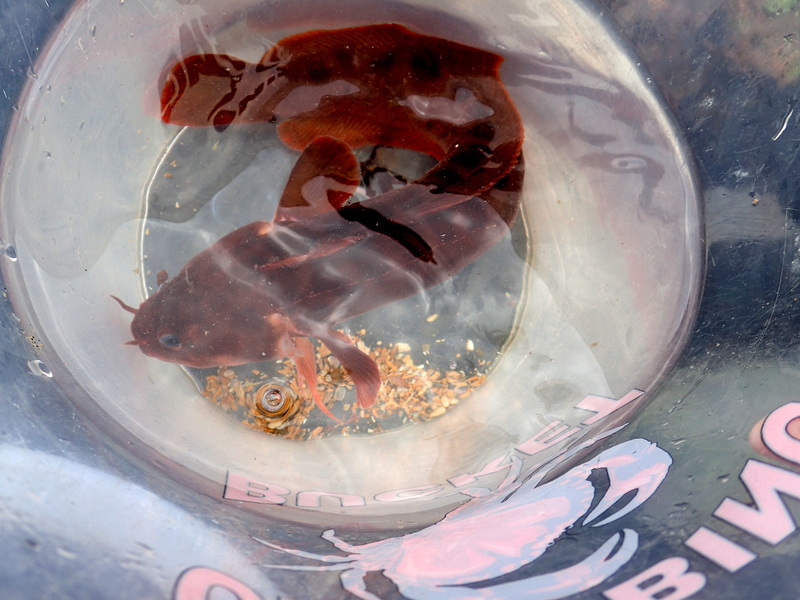 A juvenile scorpion fish – the smallest I’ve ever seen. The picnic is perfect in every way. Some of the children huddle together with their sandwiches on top of a tall rock. The smaller kids play in the sand and shower some into the olives, but no one cares. The tide has moved in but there’s still time for some last-ditch rock pooling to the east of the beach. One of the boys is desperate to find and eel and his determination pays off. He locates a good-sized common eel under a rock, but it slithers into a crevice, evading capture. Love is in the air! 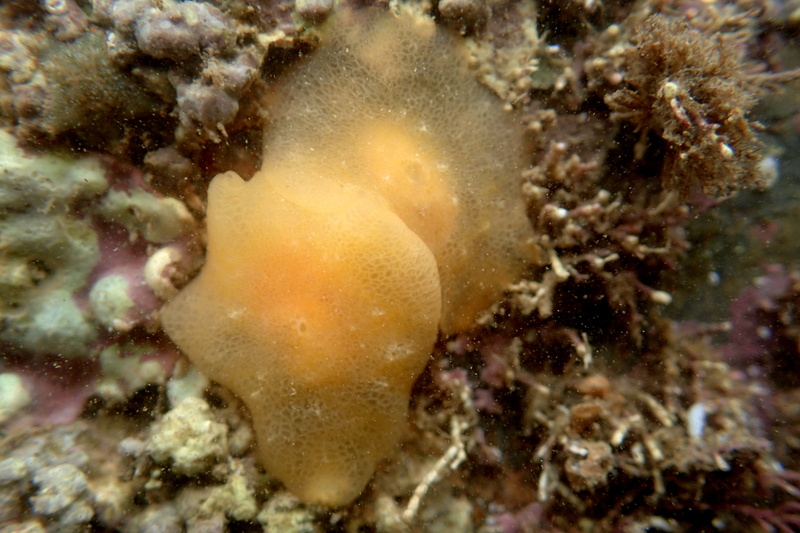 Berthella plumula sea slugs under a rock. 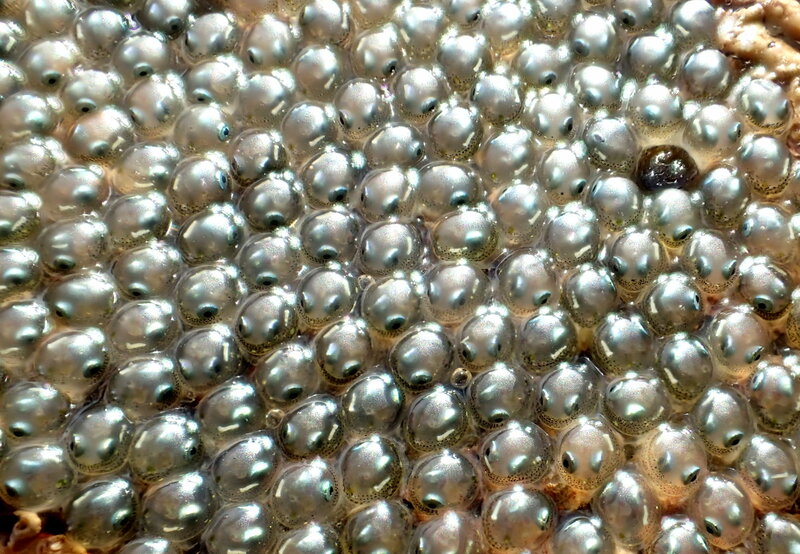 We all look closely. 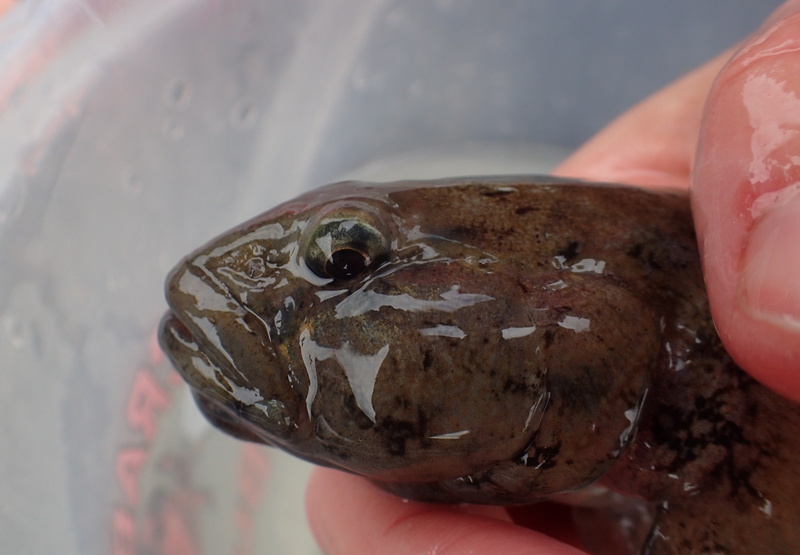 I’ve seen some big rock gobies and I know they can be hard to tell apart from the rarer giant goby. This one looks like it could be the real thing. 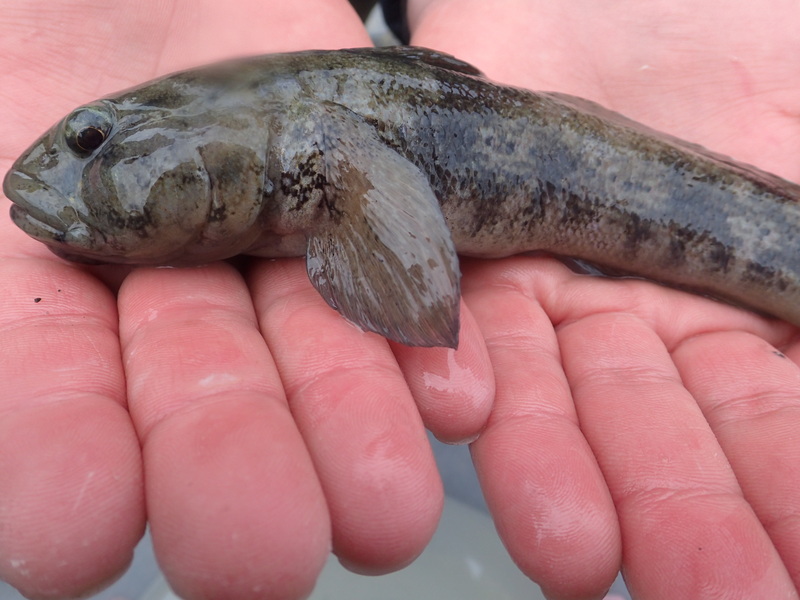 It’s large, at least 17cm, and has the fat-lipped face and salt and pepper colouring of a giant goby. 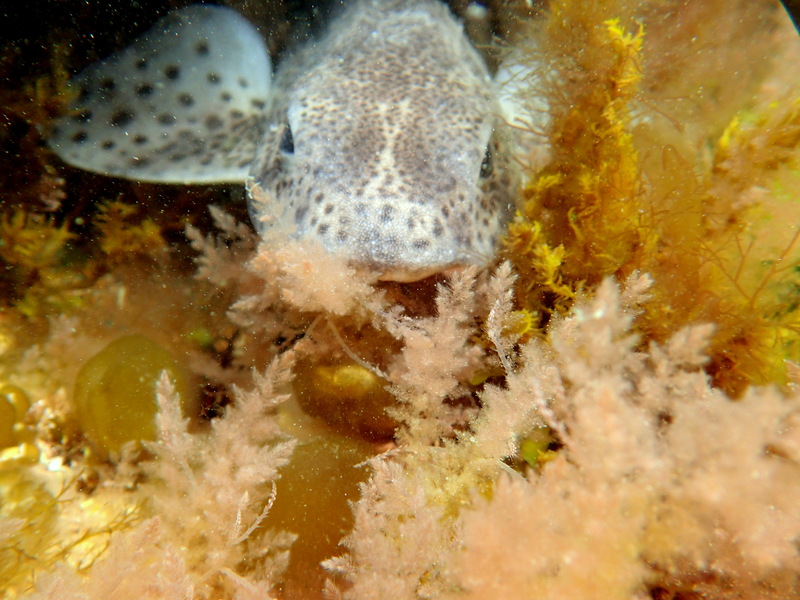 The goby’s face showing the super-thick lips. I take photos of the sucker fin on its belly and hope we’ll be able to get a definitive answer from the experts. 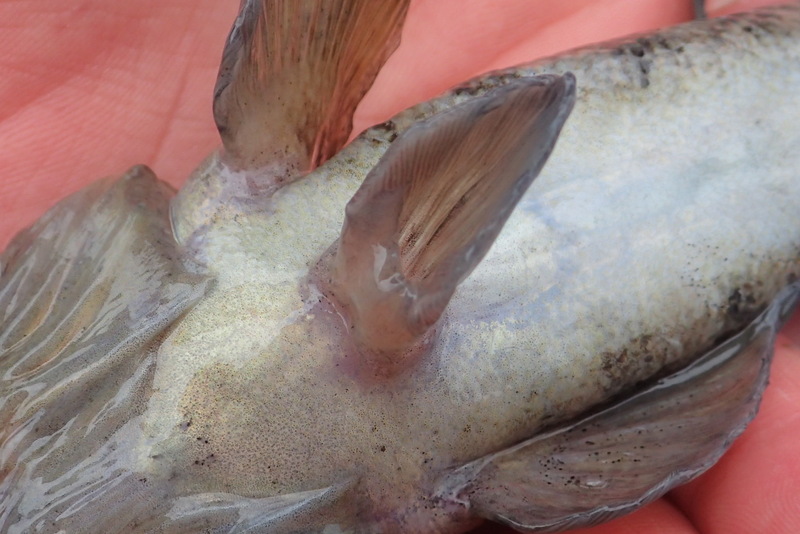 The giant goby has a detatched lobe at the front of its sucker fin which the rock goby doesn’t have…apparently. As we release the goby into the pool where we found it, the children spot their granddad walking onto the beach. He’s arrived just as the tide overtakes the last pools and he invites the kids to join him for a spot of skimming. It’s the first time I’ve been to this beach. I think I’ll be back. Some things are indeed meant to be. What a brilliant day! Thanks for sharing your finds, love reading about them. Thanks, Sue. Enjoying yours too. I love your bee photo this week. Thanks Nick. I’ll look forward to hearing what you find on your next beach trip. Wow!! There are some amazing things you have found especially the shark. Not long now until I am in Cornwall, hope I get lucky too. Thanks Sean. 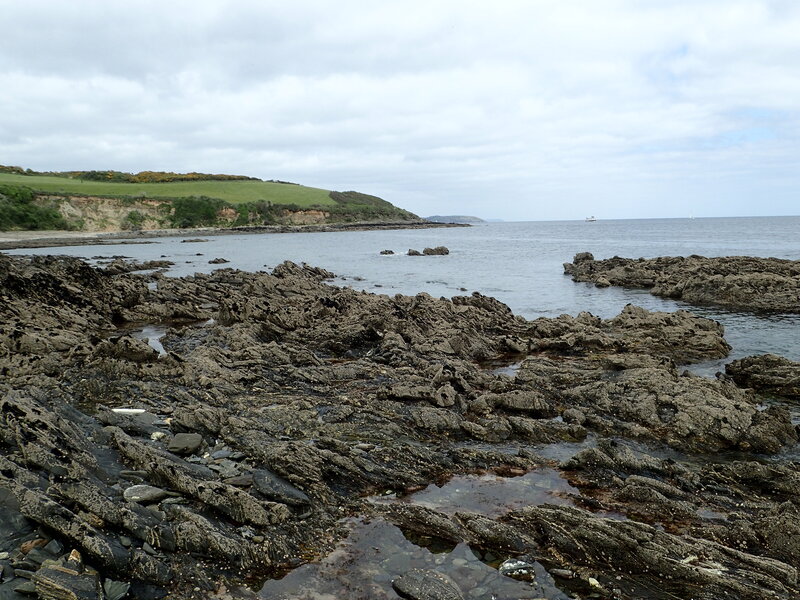 I hope you have a fantastic time exploring the rock pools. I’ll look forward to hearing where you go and what you find. As I’m sure you’ve seen, my ‘How to Rockpool’ page has some tips to help you make the most of your visit… https://cornishrockpools.com/how-to-rock-pool/ and some of my favourite places are on the ‘Beaches’ pages. You never know, I might get inspired to do a How To Draw rockpool special on my blog http://seanspetmonster.blogspot.co.uk/ while I’m over there. That’d be brilliant Sean. I’ll look forward to reading & learning. I hope you have an inspiring time.